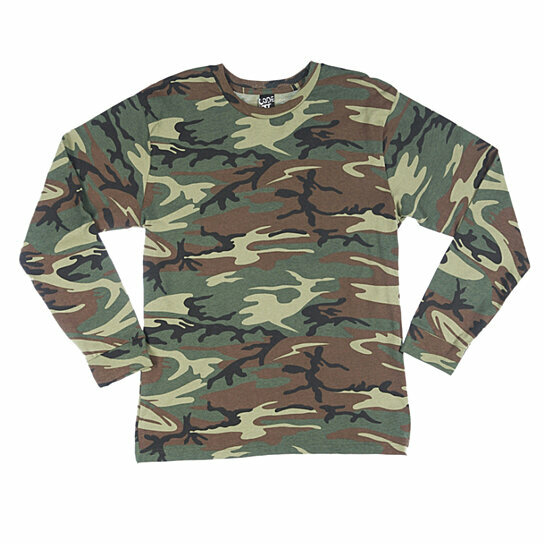 Blend in or be seen in these comfortable camo shirts great for hunting, military pride or everyday wear. 5.5 oz. 100% cotton print jersey. Ribbed crew neck. Ribbed cuff sleeves. Taped shoulder-to-shoulder. Double-needle hem bottom. Urban Woodland is sewn with 100% cotton thread. Bleed resistant ink is recommended when printing our camouflage products. Available Sizes: Large, Small, X-Large.